For eighty glorious years, with its distinctive white twin towers and the 39 steps to the Royal Box, Wembley Stadium was the English national stadium and revered as 'the home of football', from its first turf being cut by King George V until its demolition and replacement in 2003. Taking 300 days to construct, at a cost of £750,000, it was built to serve as the centerpiece of the British Empire Exhibition and first opened to the public on 28th April 1923. The first match played on the hallowed pitch was the 1923 FA Cup final, and even though the official capacity of the stadium was 127,000, it is estimated that somewhere near double that amount managed to enter the ground. The match was threatened with cancellation when the crowd spilled onto the pitch until policeman George Scorey and his white horse 'Billy' drove the crowds back onto the terraces. Forever remembered as the 'white horse final', the match ended with Bolton Wanderers defeating West Ham United2-0. In 1948 Wembley was the main venue for the London Olympics, hosting, among other events, the athletics tournament. A glass roof was added in 1963, the year in which it hosted the first of its five European Cup finals, seeing Inter Milan beat Benfica 2-1. 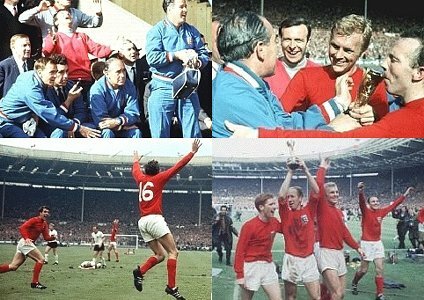 Three years later saw its finest hour, hosting nine matches of the 1966 World Cup, including the semi-final between England (2) and Portugal (1), and the World Cup final between England and West-Germany, which saw England triumph 4-2 after extra time. The stadium was to host four more European Cup finals, the first of which, in 1968, saw Manchester United's 4-1 defeat of Benfica. In 1971 Ajax beat Panathinaikos 2-0, the third in 1978 saw Liverpool beat Club Brugge 1-0 and the fourth in 1992 was a 1-0 victory for Barcelona over Sampdoria. In addition to this, Wembley also hosted two European Cup-Winner's Cup finals, the first in 1965 seeing West Ham United win 2-0 against TSV 1860 and the second 28 years later when Parma beat Antwerp 3-1. The stadium's conversion to all-seater had reduced its capacity to 76,000 when it hosted six matches at the 1996 European Championships. The last match played at the stadium was an international between England and Germany, with the last (and only goal of the game) goal scored by Dieter Hamann. Shortly after the stadium got demolished to make way for the new Wembley Stadium. that the players had to climb after a final to receive their trophy. qualified automatically for the finals. On Saturday 6th May 1961 Tottenham Hotspur had already done enough to win the 1960/61 League Championship and were facing Leicester City at Wembley Stadium in the F.A. Cup final.